Five years into the economic recovery, things are looking up for young adults in the U.S. labor market. Unemployment is down, full-time work is up and wages have modestly rebounded. But these improvements in the labor market have not led to more Millennials living apart from their families. 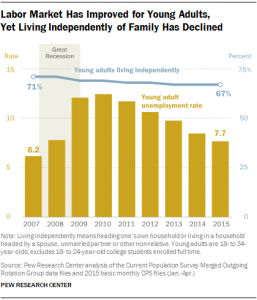 In fact, 18- to 34-year-olds are less likely to be living independently of their families and establishing their own households today than they were in the depths of the Great Recession. – The 18 to 34 year-old population has grown by nearly 3 million since 2007. – In 2010, 69 percent of 18 to 34 year-olds lived independently. – As of the first four months of 2015, only 67 percent of Millennials were living independently. – From 2010 to 2015, the share of young adults living in their parents’ homes has increased from 24 percent to 26 percent. Meanwhile, the national unemployment rate for adults ages 18 to 34 declined to 7.7 percent in the first third of 2015, a significant recovery from the 12.4 percent who were unemployed in 2010. Other standard benchmarks also demonstrate that nationally the young adult labor market has strengthened. Both job-holding and full-time employment have increased since 2010. In addition, median weekly earnings among young adult workers are up marginally: $574 through the first four months of this year, up from their 2012 low of $547.